The topography of the region is supports tropical dense sal forest , altitude ranging upto 900 mts , with gorgeous Barehipani ( 400mt) and Joranda (150mt) waterfall are the main attraction of the bio diversity. The core hilly terrain majestically roaming wild carnivorous and herbivorous animals and the pollution free dense green forest’s magnetic power of attraction make Similipal, the visitor’s Paradise. The national park is home of 1076 species of plants including 94 species of orchids . With the fauna- wild elephant ( 565 accordingly last census), Tiger (101 no. acc. Last census) including 42 species of Mammals, 231 species of Birds, 29 species of reptiles. The majestic Meghasani(1158 mts) , Khairiburu (1178 mt) with other high pick welcome the tourist ( guest) like smiling receptionists from the distance. it is the birth place of many rivers like Budhabalanga, salandi etc like the vein of Odisha. Closing of the National Park:- 15June to Oct. Entry point from Baripada and Jashipur morning 7.30am onward for the day visitor and till 4 pm those who accommodate in the eco forest cottage inside of the park . upon arrival Balesore railway station meet our representative and transfer to Similipal National Park. Check in a clean comfort eco cottage and afternoon hiking on nature trail. 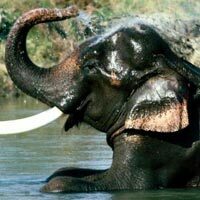 Full day excursion of Similipal National Park (rumbled around by safari). Meet the wild animal and watch the birds on nature including Joranda waterfall and tribal village. Full day excursion of Similipal National Park (rumbled around by safari). Meet the wild animal and watch the birds on nature including Barehipani waterfall. use green or grey color cloth and cap while hiking.